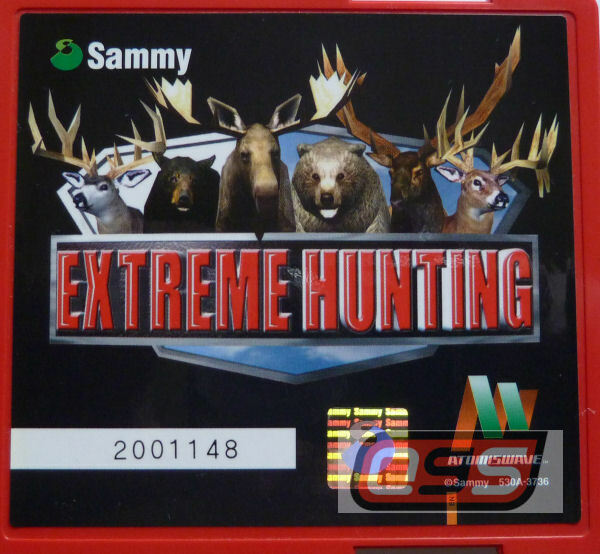 Sammy Extreme Hunting, on the Atomiswave system puts you in the middle of the woods, at the trigger of a hunter with various weapons in your arsenal, and animals out in their natural habitats. Now you must wield your hunting ability, as its now just all down to your skill, timing and accuracy as to how well you do. Skilled spots are rewarded with bonus points for particular areas. Always remember to reload your rifle during spots, as once animals are alerted they will scarper as soon as they can so speed is vital in this predicament. Remembering all this, do not go overboard with shots whilst spotting though as using up all your ammo, scaring off the animals or shooting cubs or female deer or moose by accident results in a small or zero spot result. Go for the big meat and win yourself a real prize! It's hunting season, and daddy wants a big one! Requires the expansion I/O cartridge and obviously guns.